Some dogs don’t seem to grow out of their puppy teething stage--they still love to chew, and it can drive dog owners nuts! We’ve researched and reviewed a variety of dog toys designed for heavy chewers to help you get some peace of mind. But first, take a look at the following features to consider when looking for a tough dog toy for your heavy-chewing canine! Items: Many toys come in one-packs, but there are a few that come in sets of two or more for extra value. 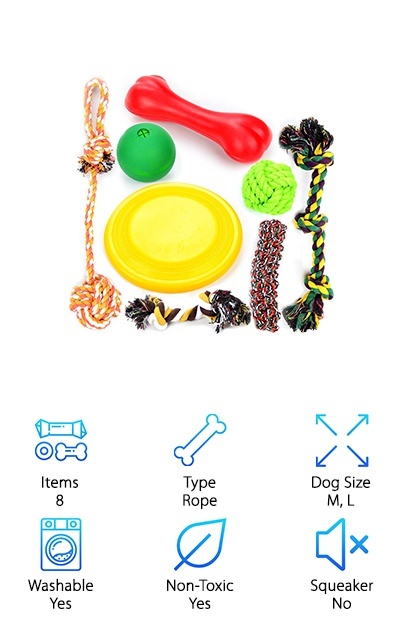 Type: We divided the main toy types into bone, rope, or ball toys, which can be interactive or solo toys for your dog. Dog Size: Some toys are one-size-fits-most while others come in different size ranges to suit small, medium, or large dogs. Washable: Slobber, dirt, peanut butter… a dog toy can get dirty, fast. Find out if it’s dishwasher safe or hand washable! Non-toxic: When your dog is a heavy chewer, you want their toys to be non-toxic since they’ll be so heavily used. Squeaker: Some dogs love squeaky toys, but some owners… don’t. Check if a toy has a squeaker before you buy! Now that you’ve considered some toy features and checked to make sure your dog hasn’t found a random object to gnaw on while you were distracted--let’s get into the reviews! Our top pick and budget pick summarize the best options if you’re in a hurry, but read them all to find the perfect dog toy for your pooch. Let’s dig in! 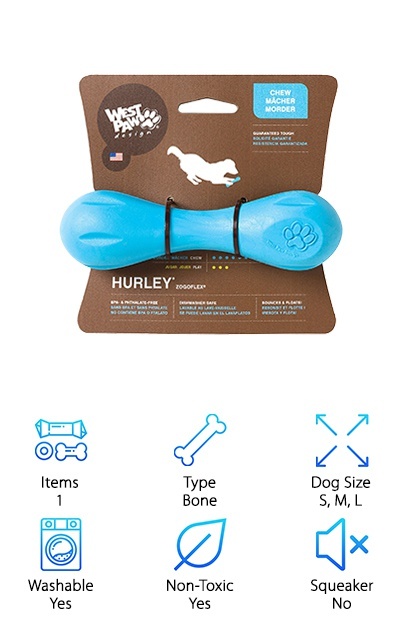 West Paw’s dog toys are made in America and super high-quality, so it’s no wonder that their “Hurley” dog bone made it to the top of our list of best dog toys for heavy chewers! It has all of the features that dog owners like to see and that dogs enjoy. It’s made from a dense, non-toxic, FDA-compliant rubber that’s BPA- and Pthalate-free. It floats, so you can play fetch on the water, and it’s dishwasher safe if it gets slobbered on a bit too much. It’s available in three sizes to suit just about any type of dog, and a variety of colors that are easy for your canine companion to spot in any environment. The bone is great for playing fetch since it has a fun, crazy bounce, and also perfect for some solo chew time. Not sure it’s tough enough? 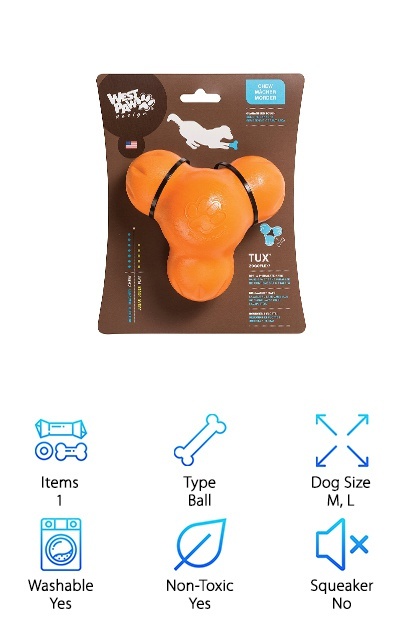 We also reviewed West Paw’s Tux toy below that has their 5/5 durability rating! The Pet Qwerks Flavorit Nylon Bone is available in small, medium, and large sizes with infused flavor options like Mesquite Chicken and Peanut Butter! It has a slightly curved shape that makes it easy for your dog to carry and fun to chew. If your pup needs some down-time in their crate, try spreading peanut butter or other tasty goo across the “flavor cells” on the bone to keep them occupied for even longer! If it gets a little drooly or you’re worried about leftover food, you can pop it into the dishwasher to freshen it up. It has a dense, hefty feel that can stand up to powerful jaws. Made in the USA, this nylon chew toy is one of the dog toys for chewers with a low price. 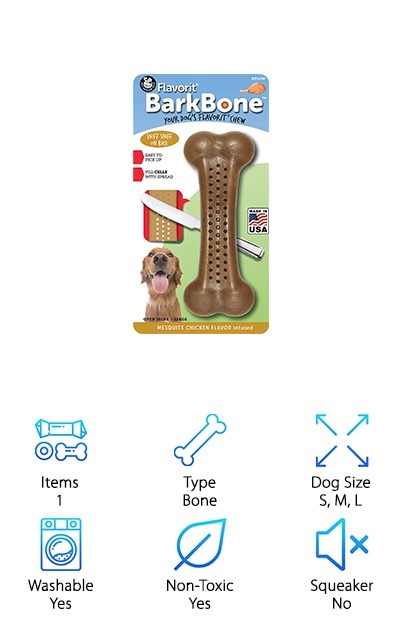 If your dog loves to chew on rigid or hard objects, this chew bone is sure to be a hit! The size of a typical baseball, the Monster Indestructible Ball’s 2.75’’ diameter may not seem like much, but it’s tough! Made from ultra-dense, high-grade non-toxic rubber, this toy has a powerful bounce. If you’re looking for a tough ball for playing fetch, this is a great option. It can work well as a stand-alone chew toy for small to medium dogs as well. Keep in mind that it doesn’t float! It’s a great size that works for a range of sizes of dog, and all ages--from puppy to senior. It’s dense enough that it’s easy to throw, and the bright orange color helps it show up in snow, grass, and just about anywhere else. It may not be the right toy for solo play, depending on the dog and their chewing style. If you want your pup to have a ball that they can’t destroy, the Monster Indestructible Ball may be the perfect choice! 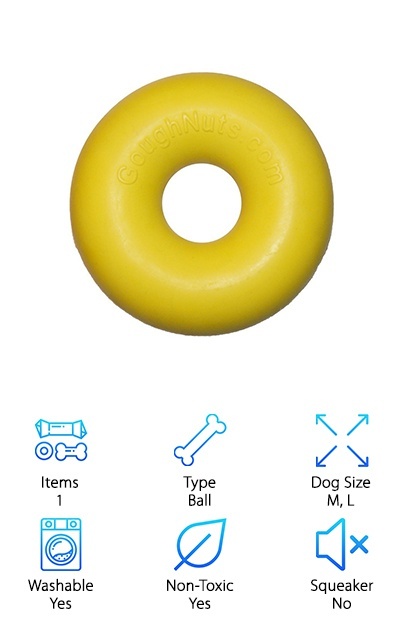 The GoughNuts Dog Chew Ring was designed to top previous dog toys for heavy chewers. It has a 5’’ diameter with a 1.75’’ cross section--a large size that makes it a good option for medium to large dogs. They come in a few other sizes as well, including the MaXX ring for medium to large dogs with especially powerful jaws. The Goughnut is designed for safe chewing. If your dog chews through the “safe” outer layer to the red inner layer, that means “Stop!” --And that GoughNuts will replace your toy. The red core is a great indicator to have that helps you know when it’s time to remove the toy from playtime. However, many people have found that the chew ring will last much longer than expected--it’s truly tough stuff! Your aggressive chewer might meet their match if they love rubbery dense toys. West Paw makes some great high-quality dog toys, and the Zogoflex Tux is just one of many of them! The Tux is made from a dense rubber material similar to a Kong, and it’s FDA-compliant, non-toxic, and free from BPA and Pthalates. You can stuff this toy with treats to give your dog a mental workout, or use its unpredictable bouncing action for fun games of fetch! If it’s starting to get dirty, just pop it in the dishwasher. You can also return the Tux to West Paw for recycling when it’s reached the end of its usable life. It also floats, so your water-loving dog can enjoy it in the pool, lake, and more! Tux is one of West Paw’s toughest Zogoflex toys, a combination of bouncy ball, chew toy, and treat-dispenser that’s hard to beat. Its multiple uses make it a great option for energetic dogs who love to chew. The Nylabone Dura Chew Stick comes in a few different sizes that work for small, medium, and large dogs. It’s part of Nylabone’s “Power Chew” line for aggressive or extreme chewers. This dog toy is infused with a bacon flavor and can be stuffed with treats as well to entertain your playful pup. If your dog likes chewing on hard or rigid objects like sticks or even plastic, Nylabone offers some great dog toys for tough chewers. The bacon flavor helps keep them interested in the toy rather than the remote control or other items. Smear some peanut butter or plain yogurt on the inside of the toy to keep them occupied or as a special treat! The Dura Chew Stick can be hand-washed with soap and water if it gets too slobbery. Puppies and adult dogs alike can get a lot of use out of this chew toy. It’s a great tool to have in your arsenal! PerSuper provides you with a value-pack of two squeaky bouncy balls plus two extra replacement squeakers. 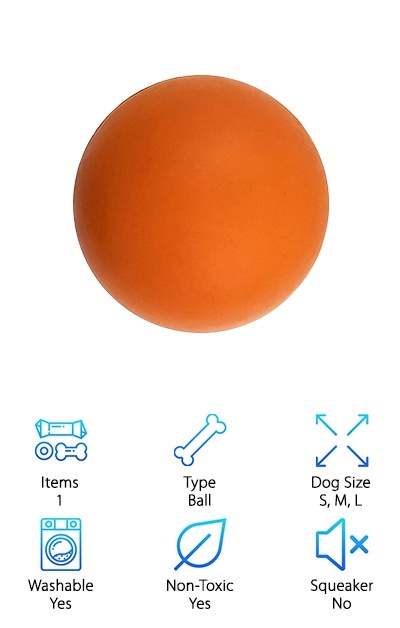 It has a 3.54’’ diameter that makes it suitable for a wide range of dog breeds, and the funky shape makes it bounce and roll in unpredictable ways. The food-grade rubber is non-toxic and flexible, with a thickness of 0.3’’ to hold up to rough play. It also floats, so your dog can play with it in the pool or at the beach! 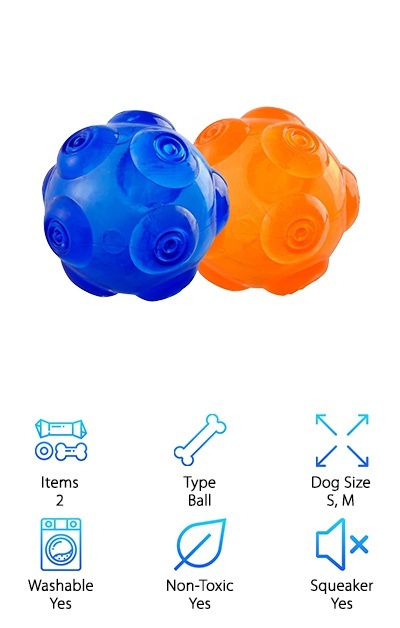 Many dogs love squeaky toys, so these entertaining balls can be a great choice for most dogs. The extra squeakers mean you can get more use out of these toys than you normally would. This toy is great for playing fetch and keeping small to medium-sized dogs occupied. Large dogs with more powerful jaws may find it too easy to destroy these toys, so it works best for dogs under 40 pounds. Rope toys can be a godsend when you’re looking for heavy chewer dog toys. Rope toys are great for teething and dental health in general. They stimulate the gums and help remove plaque and other food particle build-up from a dog’s teeth. 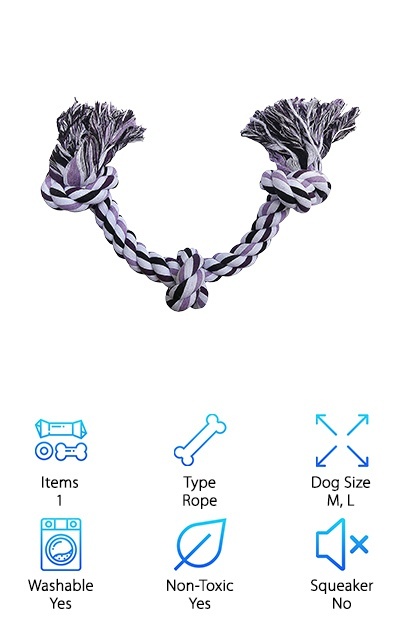 This tough rope toy is a great size for medium to large dogs and easy to wash if it gets left out in the mud or drooled on a little too much. This type of toy can entertain your dog solo as well as while playing fetch, tug-of-war, and other games. The tightly woven rope is non-toxic but tough, standing up to heavy chewing action. The substantial size and durability of this toy make it a great option for rambunctious puppies as well as adult dogs that love to chew. Whether your dog has powerful jaws or a powerful focus on chewing, this rope toy can hold up to a lot of abuse. Sometimes a variety pack is the best way to go. If your dog is still a rambunctious puppy who’s rough on their toys and gets bored easily, this eight-pack from Youngever might be a great way to slow down the destruction! It also works well for homes with multiple dogs, or when your pup is visiting with other dogs to give them toys to play with together. The pack of toys includes a rubber ball, floating frisbee, bacon-flavored bone, and five cotton rope toys in different sizes and shapes. Sometimes, the best dog toys for chewers are the ones that are inexpensive and easy to replace. 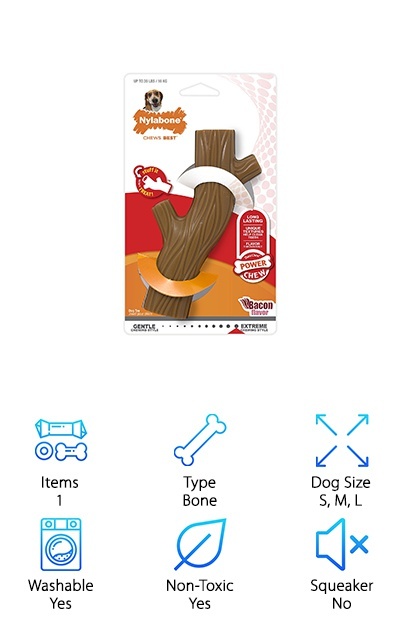 This multi-pack can also help new dog parents figure out which types of toys their dog likes best! Medium to large dogs from 35-85 pounds can enjoy these toys alone or while playing fetch or tug-of-war. Youngever also offers smaller toy packs for small breeds! 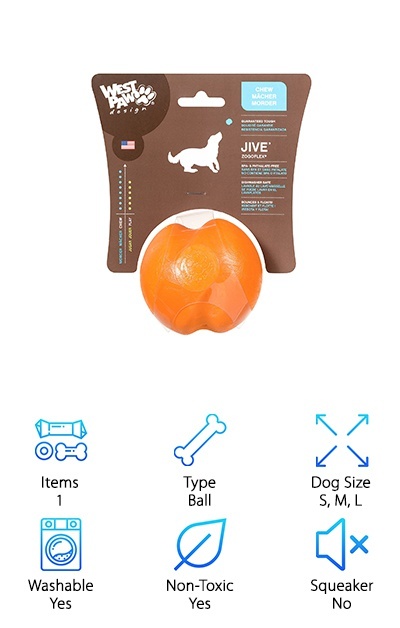 The West Paw Jive Dog Ball comes in three size options for dogs of all breeds. It has a fun, unpredictable bounce that your pup can enjoy alone or as part of a game of fetch. It’s ultra-durable and ultra-safe: made with tough rubber, but it’s BPA-free, Pthalate-free, non-toxic, and FDA-compliant. You can also send it into the manufacturer’s recycling program when your dog has totally destroyed it! It fits in most standard-size ball throwers, so it’s easier to tire out your pup. Besides being a responsible and high-quality manufacturer making products in the USA, West Paw also guarantees the Jive ball against damage. If it gets particularly dirty or slobbery, you can send the Jive ball through the dishwasher and it’ll come out good as new! It bounces and floats to ensure hours of fun playtime. Bonus: tiring out your dog can help decrease destructive chewing behavior!